The central theme of the first book pivots on a simple shift of prepositions. 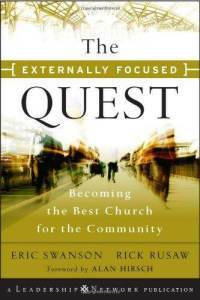 The authors suggest that most churches find themselves asking the question: “How can we become the best church in the community?” It is a question driven by market logic and competition. Shouldn’t every business in a local community strive to be the best? Should not the church seek to do the same? Such thinking immediately pits the local United Methodist Church over and against the local Presbyterian Church, the local Baptist Church, or the local Non-denominational Church. But is that really the Church for which Jesus died and rose again? Is that really the Church that the Holy Spirit empowered and commissioned on the first Pentecost? Somewhere, we have lost our way. While it is important for every church to strive for excellence in their ministry, the Church’s ultimate striving is not for a greater market share of the local population, but a striving for God’s kingdom of justice, love, forgiveness, and reconciliation to come on earth as it is in heaven. Our deepest missional longing and prayer should be for the lost, the broken, the alienated, the last, and the least – that they might find healing, renewal, and salvation in Jesus. Rusaw and Swanson, co-authors of “The Quest,” suggest a small but powerful shift in prepositions. What would happen if we changed the question to: “How can we become the best church for the community? Striving for excellence is still a laudable goal, but this question shifts the competitive impulse and places the emphasis on mission and service. This striving (or perhaps “healthy sense” of competition) sounds more akin to Paul’s exhortation to the Christians in Rome: “outdo one another in showing honor … extend hospitality to strangers, bless those who persecute you, rejoice with those who rejoice, weep with those who weep … if it is possible, so far as it depends on you, live peaceably with all.” (Romans 12:10-18) What would happen if Christians rediscovered their call to be in the world as salt, leaven, and light? The prophet calls God’s people to pray for the city. I can’t think of a better way to rediscover the church’s call to be in the world and yet not of it. Intercession – missional intercession for our community. It is my personal experience that when I pray – things happen. Prayer changes things, but perhaps more importantly, prayer changes me. I pray that God will break my heart for the community of Graham, NC. I pray that God will place a spiritual restlessness within my spirit that I might be continually prodded to “seek the welfare” of this community, knowing that in its welfare, I will find my own. Before I left staff meeting this am, I left us all with a challenge that was laid upon my heart. 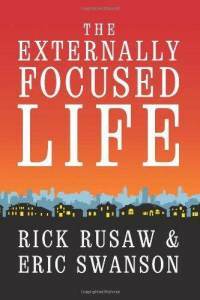 In order to more fully become an externally focused, mission-oriented church, I am convinced that we must first cultivate a prayer life that is more externally focused on our community. For the days and weeks ahead, our local church is planning to have a weekly prayer focus on the community. As we pray for specific needs, people, groups, and organizations around us, I am encouraging the congregation to also listen to God as well. Sometimes when I pray for someone or something, my prayer life spurs me into missional action – calling me to visit, to drop a note of encouragement, or to do something specific that communicates God’s love and mercy to those for whom I am praying. I have no preconceived ideas of where this will lead – but I do want to heed Jeremiah’s call to pray for the welfare of the city. I would like to encourage readers of this blog to do the same for their communities. PS: Local Graham and area residents are invited to suggest future weekly foci for our church in the weeks to come. Leave them in the comments to this post or email them to me directly. I’ve often wondered about that building as we turn the corner on our way to church. My assumptions were that some attorney(s) were located there … only a block or two from the courthouses. I will pray for those who spend their working days there in behalf of abused children. Thanks for pointing out that a statewide mission exists and works from there, Kevin. Thanks for mentioning Sustainable Alamance in the “Prayer and Praises” today. We need to keep Phil Bowers, the executive director lifted up.